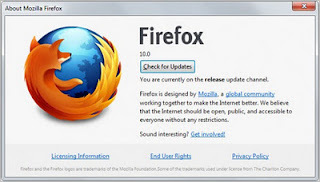 Mozilla Firefox 10 released few days back , this release is a stable version release. So, you can install it without any problems like crashing or bugs. This version released as silent update, so if you are already using firefox , your firefox browser (v9 or later) will be automatically updated to version 10.